Click here to view all retail limited warranty documents for the TCP product line. Please complete this form for all consumer warranty requests. Once a warranty request is received, it may take up to 30 business days to process. As a security precaution this web site session will expire after 20 minutes and will need to be refreshed/restarted to complete your claim. Please note all data will be lost if the session expires. 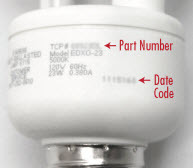 The part number is the first number found on the light bulb. The MM/DD/YYYY the lamp was installed for use. This number is found next to the UL stamp. By checking this box you agree to the terms of our warranty request process. Read our Terms & Conditions. For warranty questions, call our Customer Service toll free number: 1-800-378-6998.